This carton includes 200 individually wrapped pairs each in a reusable clamshell pack. Available in classic white, discreet beige, and super-visible hot orange! Mack's Pillow Soft Silicone are also certified as safe for use in MRI procedures. Mack's Pillow Soft Silicone Moldable Earplugs (NRR 22) (200 Pair Dispenser Carton)5KathieOctober 21, 2018Our business is floatation therapy and our customers are very satisfied with these earplugs! Thank you, Mack's for providing us with a great product! Mack's Pillow Soft Silicone Moldable Earplugs (NRR 22) (200 Pair Dispenser Carton)5Marty BOctober 14, 2018I live in a noisy New York neighborhood. I use these every night, and have done so for decades. In fact, I use a new one, or a new pair, every night. A cheap way to ensure a good night's sleep. If these folks go out of business before I do, I'll be in big trouble. Mack's Pillow Soft Silicone Moldable Earplugs (NRR 22) (200 Pair Dispenser Carton)5Elemental FloatOctober 9, 2018All of our customers love the Mack's moldable earplugs. They work great. They are easy to use. Some even take them home with them to use again. Mack's Pillow Soft Silicone Moldable Earplugs (NRR 22) (200 Pair Dispenser Carton)5JohnSMarch 27, 2018Use them to swim every day. Best product on the market! Mack's Pillow Soft Silicone Moldable Earplugs (NRR 22) (200 Pair Dispenser Carton)5HowardJuly 25, 2017We have been using these for over 20 years...best product ever, and we never leave home without them! Mack's Pillow Soft Silicone Moldable Earplugs (NRR 22) (200 Pair Dispenser Carton)5BethAugust 17, 2016Love these, soft, malleable, reusable...and if I needed, I could use them swimming. For sleeping they're fantastic. Mack's Pillow Soft Silicone Moldable Earplugs (NRR 22) (200 Pair Dispenser Carton)5JudyFebruary 3, 2016I have been using these earplugs for many years and have always been very satisfied with the comfort and noise reduction. They are easy to use and comfortable to sleep on. I buy them in bulk which makes them affordable as well. I highly recommend this product. Mack's Pillow Soft Silicone Moldable Earplugs (NRR 22) (200 Pair Dispenser Carton)5HowardJanuary 29, 2016We have been using this product for over 20 years and have ben more than satisfied. Mack's Pillow Soft Silicone Moldable Earplugs (NRR 22) (200 Pair Dispenser Carton)5MelissaJanuary 18, 2016I was skeptical when I saw the delivery time but WOW not only did they come on time as the promised but they work SUPER! I bought them as a gift for a family member who has a son with ear issues. I am thinking about ordering a some for my brother with CP that also has ear issues. Great product! Won't be going anywhere else! Mack's Pillow Soft Silicone Moldable Earplugs (NRR 22) (200 Pair Dispenser Carton)5LynnJanuary 7, 2016I don't know what I would do without these. Other earplugs just fall out and don't work well. Mack's Pillow Soft Silicone Moldable Earplugs (NRR 22) (200 Pair Dispenser Carton)5Mountrain Float SpaNovember 11, 2015We opened our floatation spa a year ago and have been using Mack's soft pillow silicone since day one. They help keep out the salt water and any external sounds that may leak into the rooms. Our clients love them and most take them home to reuse them. There is no substitute! Mack's Pillow Soft Silicone Moldable Earplugs (NRR 22) (200 Pair Dispenser Carton)5LPSeptember 29, 2015This product is very good. I tried for some time other brand name but, this is the best for me. Packing was very good and arrived it on time. Mack's Pillow Soft Silicone Moldable Earplugs (NRR 22) (200 Pair Dispenser Carton)5TeresaFebruary 22, 2013The earplugs were delivered promptly and are the best prices I've found on the internet. They're a very good product and meet our needs perfectly. We own a floatation spa and each customer is given the individually wrapped earplugs for their optional use. Mack's Pillow Soft Silicone Moldable Earplugs (NRR 22) (200 Pair Dispenser Carton)5John R SchlichtingDecember 24, 2012Daily distance swimmer. Best plugs in the world. 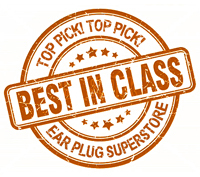 The Earplug Store has great prices, fast shipping, and always in stock! Mack's Pillow Soft Silicone Moldable Earplugs (NRR 22) (200 Pair Dispenser Carton)5johnJuly 30, 2011Fast shipping, low price, great deal! Mack's Pillow Soft Silicone Moldable Earplugs (NRR 22) (200 Pair Dispenser Carton)5MichaelJune 30, 2011Very good product and this is a good deal. Mack's Pillow Soft Silicone Moldable Earplugs (NRR 22) (200 Pair Dispenser Carton)5MarilynMarch 3, 2011Our business runs a deprivation tank so we use lots of ear plugs. These are the best I have found for our purpose and they are inexpensive. Great deal!!! Mack's Pillow Soft Silicone Moldable Earplugs (NRR 22) (200 Pair Dispenser Carton)5WendyFebruary 1, 2011These are the best ear plugs ever…due to living in a somewhat noisy apartment building I rely on these ear plugs every night. Mack's Pillow Soft Silicone Moldable Earplugs (NRR 22) (200 Pair Dispenser Carton)5johnJanuary 14, 2011Good Deal!